MANSFIELD, Ohio Vice presidential candidate Paul Ryan swept across the Midwest on Sunday playing up his regional roots in a final bid to move must-win Ohio and his own home state of Wisconsin into the Republican column on Election Day. 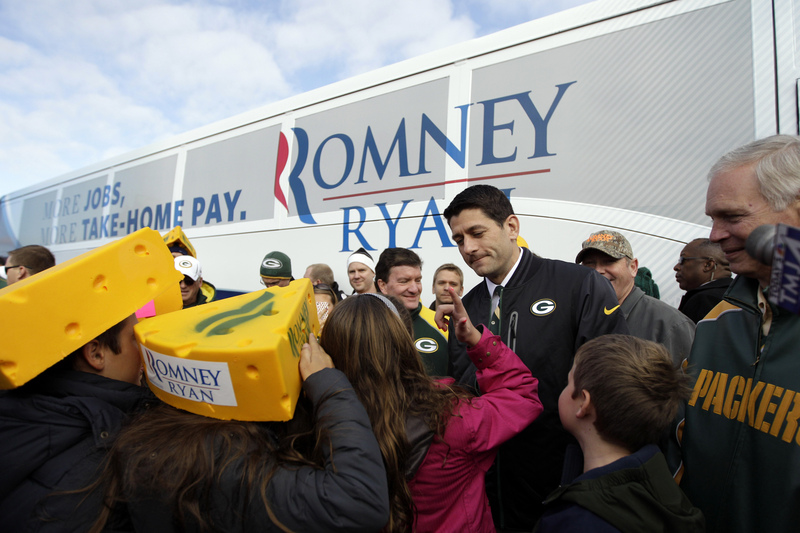 Nominee Mitt Romney's choice of Ryan, a Janesville, Wis. congressman who chairs the House Budget Committee, had the potential advantages of energizing conservative fans of his annual budget blueprints and of carrying Wisconsin, where Republicans have done well below the presidential level. Ryan and his family joined the tailgate for the Green Bay Packers game outside the Sideline Sports Bar and Restaurant near Lambeau Field on Sunday morning. Clad in a Green Bay Packers jacket and matching tie, he was immediately surrounded by what a pool report from the event described as "crush of fans and press." Some of the excited bystanders wished him congratulations in advance. "This is the longest stretch I've gone without hunting since I think I was 12 years old," Ryan remarked to a fan, as he showed off his blaze orange camouflage iPhone case - and his everyman credentials. "Just a reminder that I'll be in the woods pretty soon," he said. Ryan had by his side Wisconsin's top GOP officials, including Gov. Scott Walker, Sen. Ron Johnson and Rep. Reid Ribble, as well as Romney sons Josh and Matt. It was Ryan's sixth appearance in his home state in the past week. But even with a native on the ticket, Wisconsin and its 10 electoral votes appear to be out of reach for the GOP. An NBC News/Wall Street Journal poll conducted Oct. 28-29 showed President Obama ahead of Romney by 3 percentage points. An Oct. 25-28 survey by Marquette University Law School gave the president an 8-point lead, 51 percent to 43 percent. Ryan contended here in Mansfield that Obama has failed to revive the economy. "It doesn't have to be like this. We don't have to settle for this. This may be the best that President Obama can do but it is not the best America can do," he said. It's a tricky argument in Ohio, which has fared better than the national economy. Republican state officials say that's because their policies that have worked, but Obama - who has a slim lead in polls of Ohio -- gets credit from most in the state for saving the auto industry with a bailout Romney opposed. As evidence that Mansfield is still suffering, Ryan mentioned the GM Fisher Body Stamping Plant that closed in 2009 - just like a shuttered plant in his hometown of Janesville.